On October 16, 2014, at 10:16 a.m., Stickney Township dropped, covered, and held on in the Central U.S. 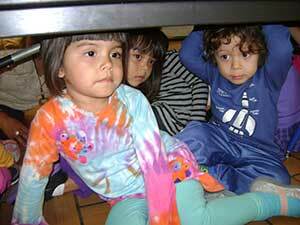 Shake Out, the region’s largest earthquake drill. This earthquake drill was our chance to practice how to protect ourselves, and for everyone to become prepared. The goal of this drill was to prevent a major earthquake from becoming a catastrophe for our staff, residents, clients and township. A couple interesting statistics showed that our region had the fourth largest North American earthquake in recorded history, with magnitudes estimated to be as large as 8.0, all occurring within a three-month period between December 1811 and February 1812. According to the U.S. Geological Survey (USGS), the central U.S. is vulnerable to damaging earthquakes and has the highest level of seismicity in the country east of the Rocky Mountains - unknowingly to the public, approximately 200 earthquakes occur each year in our region. Take COVER by getting under a sturdy desk or table, and HOLD ON to your shelter and be prepared to move with it until the shaking stops. Earthquakes typically occur with little or no warning, but you can prepare yourself and family as you would for any other disaster by teaching your family what to do and practicing the safety steps with them. Also conduct a hazard hunt in your home for items that may fall during an earthquake and move or secure these items to eliminate the potential threat. For more information and resources visit www.shakeout.org. Everyone, everywhere, should know how to protect him or herself in an earthquake. Even if earthquakes are rare where we live, they may happen where you or your family travel, or perhaps where you or your children may live one day.